The holidays are behind us, the kids are back at school and Flatchatters have their fingers poised over their keyboards (wondering what the heck has happened to the Forum). 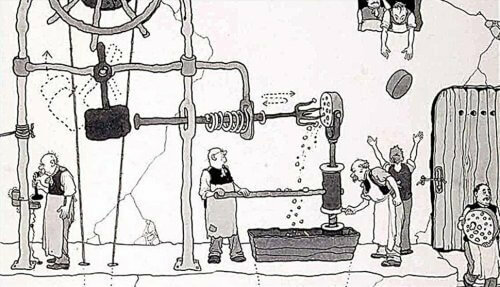 If you really are just logging on for the first time for a few weeks, you won’t know that we have given up on the running repairs that have, over the years turned the website in general and the Flat Chat Forum in particular into one of those crazy Heath Robinson contraptions. Instead we have cleaned out the back end and installed new software. All we need now is to find out how to make it work as well as the last system. By the way, for those of you who haven’t heard of Heath Robinson he was a humourist, cartoonist and absurdist. The illustration above is of a machine for putting holes in Swiss cheese. His art has been described as devising incredibly complex machinery that achieves very simple results. Sounds like Fair Trading. And on that note, let’s get straight into this week’s top posts on the Flat Chat Forum. Some of us lease our apartments to a hotel in our mixed-use block. Now the Owners Corp wants to increase our levies to pay for additional wear and tear. Can they do that? That’s HERE. Can a new by-law retroactively ban air-conditioning (because the current by-law has failed to stop one installation)? That’s HERE. What’s the name of the gas they use to deal with mould in confined spaces? And is it safe? That’s HERE. Looking to rent a pet-friendly apartment, I find a lot are on the market. Does that mean there will be a lot of competition too? That’s HERE. Pensioners get discounts for electricity and council rates – why not levies? That’s HERE. We’re still tweaking the website to get it up to scratch – and, in fact, be faster and easier to use than ever. We welcome your comments, positive and negative and you can make them HERE.